The battle opened on October 7, 1780, around 3 pm when 900 Patriots (including John Crockett, the father of Davy Crockett), approached the steep base of King's Mountain at dawn. The rebels formed eight groups of 100 to 200 men. Two parties, led by Colonels John Sevier and William Campbell, assaulted the 'high heel' of the wooded mountain, the smallest area but highest point, while the other seven groups, led by Colonels Shelby, Williams, Lacey, Cleveland, Hambright, Winston and McDowell attacked the main Loyalist position by surrounding the 'ball' base beside the 'heel' crest of the mountain. The Patriots crept up the hill and fired on the Loyalists from behind rocks and trees. Ferguson rallied his troops and launched a bayonet charge against Campbell and Sevier's men. With no bayonets of their own, the rebels retreated down the hill and into the woods. Campbell rallied his troops, returned to the base of the hill, and resumed firing. Ferguson launched two more bayonet charges during the course of the battle. 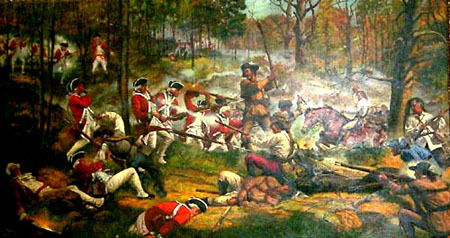 During one of the charges, Colonel Williams was killed and Colonel McDowell wounded. However, after each charge the Patriots returned to the base of the hill and resumed firing. It was hard for the Loyalists to find a target because the Patriots were constantly moving using cover and concealment. After an hour of combat, Loyalist casualties were heavy. Ferguson rode back and forth across the hill, blowing a silver whistle he used to signal charges. Growing desperate, he slipped on a plaid shirt to cover his officer's coat. A soldier on one side or the other saw this and alerted his comrades immediately. At the crest, as the Patriots overran the Loyalist position, Ferguson fell dead from his saddle with eight rifle balls in his body. Seeing their leader fall, the Loyalists began to surrender. Eager to avenge defeats at the Waxhaw Massacre and elsewhere, the rebels did not initially want to take prisoners. Rebels continued firing and shouted, "Give 'em Tarleton's Quarter!" After a few more minutes of bloodletting, the Colonials asserted control and gave quarter to around 700 Loyalists. Upon arriving at Kings Mountain, the Patriot soldiers dismounted. After tying up the horses, the soldiers formed in a horseshoe around the base of the mountain behind their leaders, who remained on horseback. Ferguson was right in believing that his would be attackers would expose themselves to musket fire if they attempted to scale the summit. But Ferguson did not realize his men could only fire if they went out into the open, exposing themselves to musket fire. Most of the Patriot troops were skilled hunters who routinely killed fast moving animals. On this day, Ferguson's men would not find escape an easy task. The fighting began around 3 p.m. when some of Ferguson's men noticed the Patriot soldiers surrounding the mountain. After a brief skirmish, the shooting began in earnest when two of the Patriot regiments opened fire on the Loyalists simultaneously. The Loyalists fired back but the Patriots were protected by the heavily wooded area. The regiments commanded by Colonels Isaac Shelby and William Campbell marched toward Ferguson's men but were driven back twice by Loyalist fire. But as one regiment was driven back, another would advance. Ferguson had to shift his reserves from one place to another while continuing to take heavy losses from the concealed American sharpshooters in the trees. Eventually, other Patriot troops provided enough support that Shelby and Campbell's regiments reached the summit. During the battle, Patrick Ferguson commanded his men with the use of a silver whistle. Many Patriot fighters later recalled hearing the sound of Ferguson's whistle over the sound of the rifle fire. The whistle and the checkered hunting shirt he wore over his uniform made the Scottish commander quite noticeable on the battlefield. After nearly an hour of fighting, Ferguson suddenly fell from his horse. One foot was hanging in his stirrup -- several, perhaps as many as eight bullets were in his body. Some accounts say he died before he hit the ground. Other accounts say that his men propped him against a tree, where he died. Ferguson was the only British soldier killed in the battle -- all others were Americans, either Loyalist or Patriot. Ferguson's second in command then ordered that a white flag of surrender be hoisted. After the battle, the victorious Patriots and the captured Loyalists had to camp together. Soon it became dark and the cries of the wounded were heard and often unheeded. The next morning, the sun came out for the first time in days. Fearing that Cornwallis would soon be upon them, many of the Patriot militia left for their homes. A contingent of Patriots took the prisoners northward to the Continental Army jurisdiction in Hillsborough. During the journey, a number of prisoners were brutally beaten and some prisoners were hacked with swords. A number of unjust murders took place -- not the Patriots finest hour. The injustices continued a week later when a committee of Patriots appointed a jury to try some of the so-called "obnoxious" Loyalists. 36 Loyalists were found guilty of breaking open houses, burning houses and killing citizens. Nine were hanged. Cornwallis was shaken when the news of Ferguson's defeat reached his headquarters. He remained in Charlotte a few days before withdrawing back into South Carolina to the British post at Winnsboro. The British could not count on reinforcements from other South Carolina posts to help them -- the news of victory at Kings Mountain had revived Patriot hopes. The victory triggered bonfires and street dancing in cities held by the Patriots. Soon, Patriot leaders such as Thomas Sumter, Elijah Clarke and Francis "The Swamp Fox" Marion stepped up their harassment of British troops. Patriot sympathizers increased their assaults on Tory neighbors.